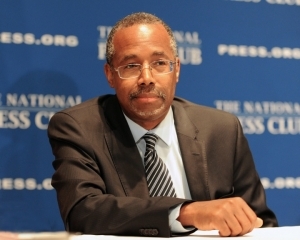 Conservative activist Dr. Ben Carson said he has "taken no steps" to run for president in 2016, though "perhaps God has a different plan for me." "I've got to tell you, I do not wish that job upon anybody—including myself." he said at a May 28 Club luncheon. But he refused to rule it out. "Perhaps God has a different plan for me," he said. God figured prominently elsewhere in Carson's speech as well. "I think the reason this nation rose to the pinnacle, faster than any in the history of the world is because we live by godly principles, of loving your fellow man, caring about your neighbor, developing your God-given talents to the utmost so you become valuable to the people around you," he said. "Of having values and principles that govern your life. If we can regain that, then we truly will have one nation under God, indivisible, with liberty and justice for all." He said his mother raised two young boys by herself, and it was through concerted self-reliance that she was able to pull through. "She worked so hard because she didn’t want to be on welfare," he said. "She felt she needed to be an independent soul." Carson embraced the Republican call for eliminating President Barack Obama's health-care law, which is designed to provide insurance to millions of uninsured Americans. Instead, he proposed health savings accounts, whose balance could be shared among family members. That would subject health care to the rigors of the market, rather than wasteful "layers and layers of bureaucrats," while still retaining some state support for health, Carson said. He also called for cutting taxes on corporations to take "the heavy foot of government off the neck of industry and business."